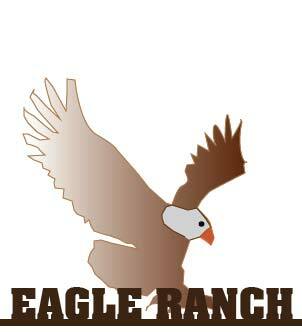 Shown above a wrought iron hanging sign Eagle ranch, cut out in a silhouette of a Bald Eagle underlaid behind the ranch's name., We precisely cut silhouette signs like these with our water jet citter, which is computer controlled. After cutting, the sign can be metal-coated with bronze, brass, copper, stainless steel, or rusty iron, or alternatively it can be painted in a variety of colors, as for the sign shown, an airbrush was used to get the shading variation on the left wing. Also, it can be sandblasted in some areas to produce contrast for features of the image. This plaque has a weld-on overlay (ranch name) for a 2.5D (flat relief) look.